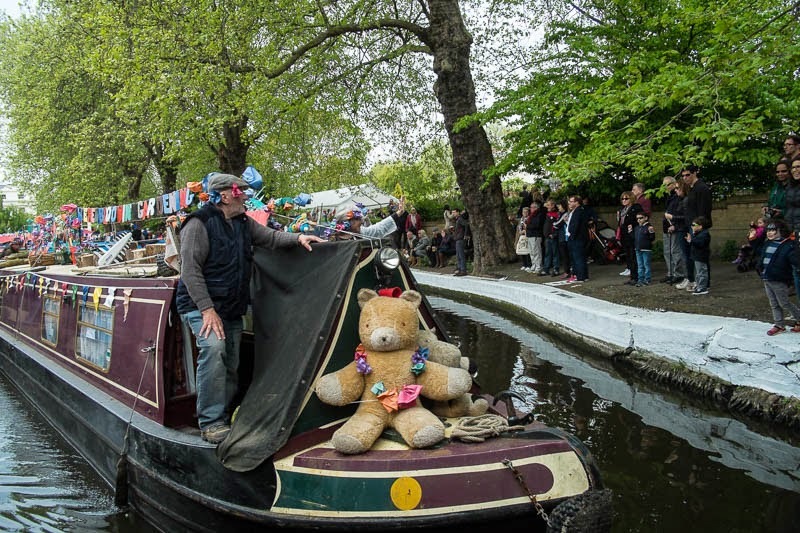 Dozens of narrowboats converge at Little Venice on Regents Canal every year at May Bank holiday. Some have taken days to get here, one took six months! It's a bit of a festival and bit of a trade show for the boaties. (is that what canal boat owners call themselves?) Fun and entertainment for the rest of us. Used to pass Little Venice daily. Always wanted a boat there. Oh yes, that would be fun to see! Those narrow boats have a whole lot of character. The comment directly above mine from this "save one" is making the rounds. The twit spammed me today. Narrow boats have long charmed me. One of these days I might take a trip on one, though my first venture on a small boat will be a French barge trip in September. If that is successful, an English narrow boat might move up the bucket list. And someone took their Ted along for the ride, I see! !